Outdoor adventuring does not have to leave you sitting on a log or, worse yet, the soggy ground. A good quality, comfortable camping chair can be one of the greatest outdoor companions you will find. There are so many options for quality camping chairs these days. What features you need (portability, weight, comfort, durability) will largely dictate what you consider to be the best camping chair, but no matter your needs, you should feel confident that the chair under you will serve its purpose without landing you on your bum. 1. What Is a Camping Chair? 2. 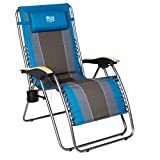 What Are the Best Uses for Camping Chairs? 3. 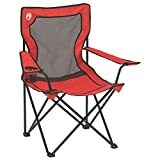 What Features Are Most Important When Choosing a Camping Chair? 4. Where Can You Buy the Best Camping Chair? We have reviewed a variety of types of chairs in this article and have come up with what we think are the best camping chair options for your time spent outdoors. Backpackers, campers, RV owners, and people with porches, read on to get our recommendations for the best camping chairs of 2018. A camping chair is a portable chair designed for the outdoors. Most camping chairs are made to withstand weather, being made from materials that can be outdoors. They often fold up and come with straps or a bag for ease of carrying. People use camping chairs for a variety of activities. 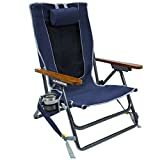 Some common uses for camping chairs are while fishing, camping, sitting by a fire, attending concerts or sporting events, or relaxing and looking at the stars or other scenery. Which features are important depend on what the chair will be used for. Consider weight and size if you will be backpacking. Consider comfort if you are older or less fit or plan to spend long amounts of time sitting in your chair. Ease of use may be the most important thing for some who don't want to fiddle with clasps, locks, or straps. Be sure the chair you pick carries a decent warranty and fits within your budget. The best camping chairs can be purchased at retail stores, online stores, and most big box stores. Discount stores often carry camping chairs also, but they may be of lower quality. The following products were reviewed based on the following parameters: features, pros and cons, price, where to buy them, and warranty information. Using these parameters, we have decided which chair is the best camping chair of 2018. We looked at what the manufacturers advertise and how that holds up against product reviews as well as what actual users report as good and bad about each chair. We look at prices against the average and try to provide you with options in each price category. All the chairs reviewed here carry at least a one-year manufacturer warranty and get good general reviews from users. The types of chairs we reviewed range in price from $20 to $150. The more expensive chairs tend to be more popular and hold up better; the mid-range chairs have loads of extra features and good warranties; while the least expensive chairs tend to not hold up as well over time with rough use, but are smaller and more portable. The Helinox Swivel Chair is small (28x20x21) and lightweight at only 2.6 pounds. It features a swivel base that turns a full 360 degrees so you can see the bears behind you, the lake to your left, or your marshmallows roasting on the fire without getting up. A chair that integrates a full swivel and weighs less than three pounds is quite impressive, and it also carries an impressive price tag. The Helinox Swivel Chair has a 5-year warranty, and the manufacturer claims you can return the product if you do not absolutely love it. Coleman is a reliable brand with consistently decent products at a budget price. With care, the camping chair will work well for light use. The Coleman Broadband Mesh Quad is 21.3x31.1x35.8 inches and weighs 6 pounds. The Coleman Broadband Mesh Quad has a 1-year limited warranty. Dimensions: 19-Inch W x 28-Inch H x 26-Inch D Weight Capacity: 300 lbs. Carry Weight: 7 lbs. 10 oz. The Eureka Campelona Chair is 24x24x46 inches and is one of the heavier chairs at 12 pounds. This chair reclines in three different positions and its tall back is great for tall people. It has storage big enough to hold all your personal items and drinks, as well as a place to clip your keys. The Eureka Recliner Camp Chair has a 1-year limited warranty. 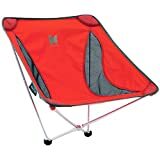 The Alps Mountaineering King Kong is considered by some to be the best camping chair for big people. It is 20x38x38 inches and weighs a heavy 13 pounds. Heavy duty, durable, rugged, and yet attractive and comfortable, this chair will be the hit of your campsite. It has multiple cup holders and storage spots and is easy and quick to set up. This chair, which is the best camping chair for big people, comes with a limited lifetime warranty. The Melissa & Doug Sunny Patch Happy Giddy Outdoor Folding Lawn and Camping Chair is just for kids! At 25x13x12.75 inches and only 2.7 pounds, it is great for little ones who want their very own camping chair. Kids will outgrow this chair after some time, but many parents claim it works well into the preschool years. 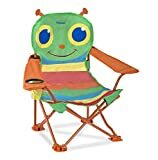 This is definitely the best camping chair for children. The warranty for the Melissa & Doug Sunny Patch Happy Giddy Outdoor Folding Lawn and Camping Chair is unknown. Some sites suggest requesting one from the manufacturer. The TravelChair Slacker Chair Folding Tripod Camp Stool is 12x14x20 inches and weighs 2.2 pounds. It is one of the smaller adult chairs available. 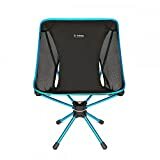 It is a great backpacking chair as it is smaller and lighter than most chairs, folding up to the size of a rolled up newspaper. It has larger feet so it can be more sturdy on muddy or candy surfaces. It provides great features for a small price. The TravelChair Slacker Chair Folding Tripod Camp Stool has a 1-year warranty. The GCI Outdoor Wilderness Recliner features a backpack-style carrying system, good lumbar support, and a great warranty. In all ways, it is an average camping chair. It measures 17x25.5x31.5 inches and weighs 9 pounds. The GCI Outdoor Wilderness Recliner carries a limited lifetime Warranty. The Renetto Original Canopy Chair is 23x19x18 inches and weighs in at 16 pounds. It is the heaviest portable chair we reviewed. This chair is probably the best camping chair for people who need protection from the weather. It has a full canopy with sides that drop down. The canopy serves as the bag for the chair when it is folded up. The Renetto Original Canopy Chair carries a 1-year limited warranty. 2-legged rocking chair allows you to sit comfortably on flat or uneven ground. The Alite Monarch chair is an innovative chair that will keep you working while relaxing. It works much like a balance ball, causing you to use your core muscles and legs to stay upright. This chair is ideal for serious outdoors lovers but less so for the lazy car camper. It is 23x21x17 inches but folds up to the size of a pocket umbrella and is a lightweight 1.3 pounds. The Alite Monarch carries a lifetime guarantee covering all defects, materials, and workmanship. The Timber Ridge Zero Gravity Chair is the least portable, but it may be the most comfortable chair we reviewed. It is 43x22x21.5 inches and weighs about 20 pounds. As a zero-gravity chair, this camping chair is designed to elevate your legs and remove pressure from the spine. This is a super comfy chair with lumbar support, a built-in pillow, and adjustable armrests. It is comfy enough to be used for naps in the backyard. It is okay for car camping, but not portable enough for backpacking. The Timber Ridge Zero Gravity Chair carries a 1-year warranty. Choosing the best camping chair is a very specific process. It helps to first decide what you will use your camping chair for. If you are a backpacker, you will want to opt for a lightweight and portable model such as the Alite Monarch, which is a chair with a mid-range price and a lifetime warranty. General car campers and stationary fishermen will probably be happy with the Alps Mountaineering King Kong. People looking for a porch chair or one to place outside their RV should consider the Timber Ridge Zero Gravity Chair, which is like having a recliner at your campsite. If you are a little one, how can you pass up the Melissa & Doug Sunny Patch Happy Giddy Outdoor Folding Lawn and Camping Chair? No matter your needs, their is the best camping chair out there for you.